Rest in eternal peace, Deputy Sheriff Chism, for we have the watch now. Your family and your brothers and sisters in uniform, our brothers and sisters, too, are in our thoughts and prayers. May they find comfort in remembrances of your dedication and service. My sincere condolences to his family. His heroism will not go unnoticed and he will always be your "hero"... "never forgotten". One hour at a time right now with the shock and roller coaster of emotions. Praying peace and comfort for his wife, daughter and family. RIP Deputy Sheriff Michael Chism! so sorry to hear about this officer's death,my thoughts and prayers to the family,it seems police officers job duties are becoming more dangerous each day. Our Department is saddened by your loss and the loss of your brother officer. God Bless his family. There is no greater scarifice. Thank you for your service Deputy Chism. Those who know and love you will keep you alive. OUR DEEPEST SYMPATHY TO THE FAMILY OF DEPUTY CHISM, AND ALL THOSE WHO MOURN THE LOSS OF DEPUTY CHISM . 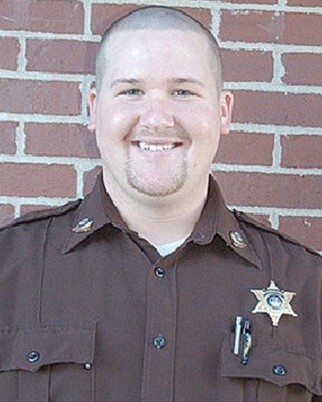 Deputy Sheriff Matthew Chism, during your tour of duty you served your state and county with honor and dignity. It is now your time to rest with all of the other heroes that have gone before you, we will carry on from here. To the family of Deputy Sheriff Matthew Chism you all are in our thoughts and prayers. The Law Enforcement family will stand beside you. To the men and women of the Cedar county Sheriff's Department hold your heads high as you all carry on during these difficult times. Stay safe and remember that you are never out of the fight. Fair Winds and Following Seas WARRIOR. I pray for this mans wife and child . I hope they can pick up move forward . With current dis function in state of Missouri . I hope They leave this family alone My Prayers heart go out to you. For it is better, if the will of God be so, that ye suffer for well doing, than for evil doing." May God hold your family tight! We'll take it from here brother, rest in peace. Deputy Matthew Chism, judging by your smle in your official photo--I would say you were a happy man and proud to serve your Department. I would have liked to have you on my squad. I feel bad that your life was ended so soon while performing your duty as a Deputy Sheriff. You did your duty well and now it is up to us to fill your shoes and assume your watch. May you rest in peace and god be with your family and your Department through this terrible event that has taken your life. Rest in peace, Deputy Matthew Chism. May your family and friends be comforted during their time of grief. Thank you for your sacrifice to your community and our great Nation. God bless, brother. Our prayers to Deputy Chism's family at his loss. We know his County appreciated his service and he served no doubt with pride and caring for others. May GOD be with the family as they go through this rough time. GOD Bless you all. Your service will be forever remembered. Thank you for protecting our streets. Please accept my sincere condolences for the tragic loss of Deputy Chism. I have submitted at least six of these message this week. It is getting harder and harder to be a LEO. My thoughts and prayers are with you and the families concerned. Sadly this will continue as society continues its downward spiral. My God conform you at this most difficult time. RIP Deputy Chism. God Bless your family, friends, and co-workers.